Do you adore Big Macs, but loathe the prospect of face-to-face interaction with other human beings? 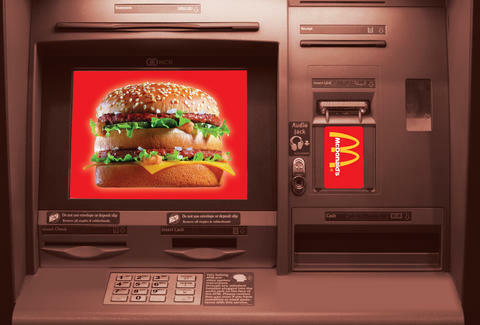 If so, you'll be in love with this McDonald's Big Mac ATM (or at least burger-lust after it). You are not hallucinating. The Golden Arched fast-food giant actually created an automatic burger slinger that would make any hungry misanthrope spill their special sauce in excitement. As The Boston Globe first reported, the Big Mac ATM will be placed in Boston's Kenmore Square (a busy intersection right by Fenway Park) between 11am and 2pm on Tuesday, January 31. Oh yeah, and don't worry about your bank account taking a hit -- all the Big Macs dispensed from the ATM will be totally free of charge. So you can definitely expect a line. And while the burgers don't cost any money, there is a catch: Anyone snagging a Big Mac from this machine will need to input their Twitter handle on a touchscreen. The ATM will then send out a tweet (it's alive!) from your handle, pontificating on the wonders of Big Macs and McDonald's and Big Mac ATMs. Basically, it is turning your Twitter into an ad, and paying you in cheeseburgers. There have been worse deals. Unfortunately for the hungry masses, this is most likely a one-off promotional campaign. 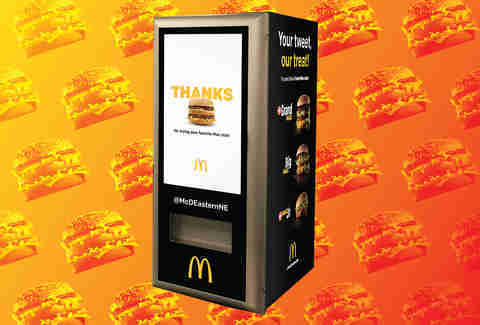 Don't expect to see these Big Mac machines popping up on street corners, or even in your local Micky D's. A McDonald's franchisee who was involved with the project assured the Globe that this is a simple marketing stunt, and not a harbinger of the future of McDonald's. While this is far from the first time food has been served in the vending machine/ATM construct, it is the first time the world's biggest fast-food chain will bring its double-patty talents to this arena, so it is kind of a big deal. But perhaps McDonald's money would be better spent on fixing its eternally broken McFlurry machines?